The initial concept for the 157-unit development at 1950 Mission St. Design by David Baker Architects. 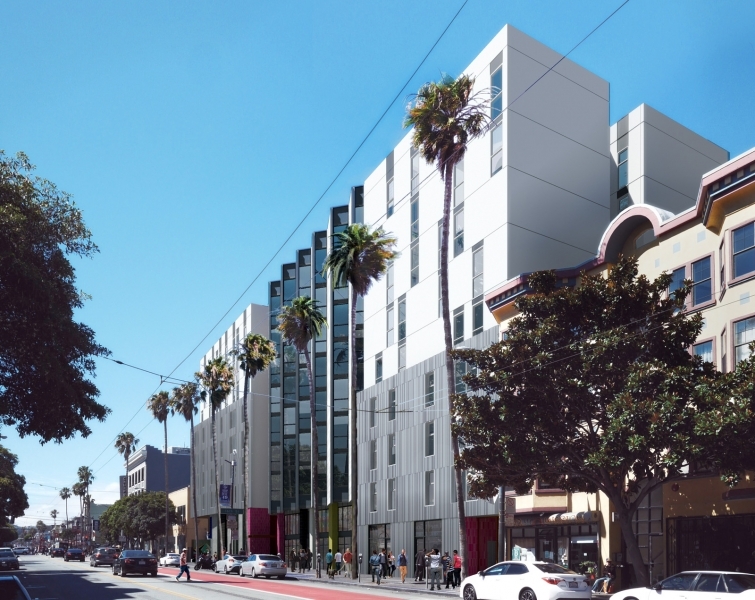 Around 20 construction jobs will be up for grabs this Saturday as the fully affordable development at 1950 Mission Street prepares to break ground. Swinerton Builders, Mission Housing, BRIDGE Housing, and CityBuild Academy are hosting a recruitment fair for Mission residents to begin their careers in a wide range of construction jobs pertaining to the first phase of the 157-unit project, the largest 100-percent affordable development in the pipeline. That includes demolition, digging, laying the foundation, and building the concrete structure. “We’d love to see upwards of $2 million in union wages for Mission residents,” said Mick Penn, the community relations liaison for Swinerton, the general contractor for the project. He noted, however, not all of the new hires will be working with Swinerton per se; some will be hired by the project’s subcontractors. He said upwards of 75 workers will take on the first phase of the project, but over the 19-month project timeline, the project will need as many as 450 workers. Penn added that Swinerton is moving several of its Mission resident workers to this project so they can work in their own community, and it is encouraging its subcontractors to do the same. “We’re really trying to have the money that’s gonna cost to build this project circulate back into the community,” he said, noting that CityBuild was instrumental in making the new hires happen. The event is from 2 to 5 p.m. at Valencia Gardens (390 Valencia Street). “It’s such a great location,” said Tasha Delancy of Vanguard Properties, which is assisting in selling the business. That’s because, she asserted, tastes and preferences are changing with the city’s new demographic that prefer more “freshness on the plate,” as well as more intimate Italian restaurants and cafes. She said that, generally, she’s seen a lot of restaurateurs of the previous generation put their restaurants up for sale. “It’s a sign of the future changing right in front of us,” she said.